Bajaj LITE just two days before the Auto Expo 2008. Though the car is a concept care and mass production of the machine would be somewhere 2 years down the lane in collaboration with Renault, but even for a concept, the car looks pretty good. If Bajaj manages to provide proper servicing chains, then with the spares also being cheap, Bajaj can seriously challenge the dominance of Maruti Udyog in providing consumer satisfaction and value for money. 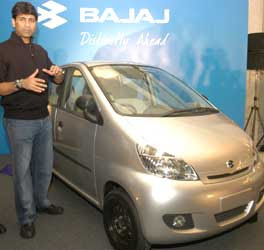 Going by it's nack of providing value additions to it's products that's different from the set trends , Bajaj has also announced that the vehicle, fitted with a unique two cylinder engine, would be equipped with a hybrid transmission system that would be an amalgamation of Manual Transmission and Automatic Transmission. But the target the company has set for itself on the mileage front can prove to be a testing ground as achieving a 35kmpl mileage for a four wheeler with an engine capacity of anything between 600 cc-800 cc can prove to steep climb. But the catch here is that weather the mileage target has been set for patrol variants or diesel variants has not been made clear still. At the same time, Renault has said that the car would cost somewhere around $3000, i.e. Rs.1,17,000 by current exchange rates, but again since this is a concept car, the actual production cost might vary a great deal. 1) Mass production in 2 years can prove to be a bit too much for Bajaj with the competition getting more and more stiff in this segment. 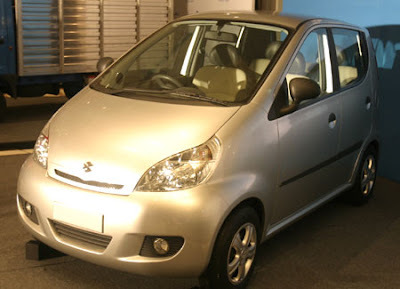 2) Like the bike market, the small segment car market is also getting geared up of a major Clash of Titans!!! !